Having the proper dental practice layout is important for productive flow of operations. 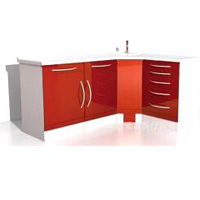 An important feature of a dental office is the cabinetry. Having sufficient and well-placed cabinetry and storage can help produce a sleek, modern and productive work environment. Dental cabinetry can include dental operatory center islands and dental operatory mobile cabinetry, which can provide needed counter space. Computer cabinetry can hide cables and other accessories, while dental operatory rear and side cabinetry can provide ample storage room for instruments and supplies. Even dental x-ray pass-throughs are available for convenient and attractive access between adjacent operatories. Choosing the proper dental cabinetry is key for an organized and appealing dental office.